These posts are about any plants and animals I happen to run into, whether or not they’re “wild”. Actually it’s mostly photos in gardens. 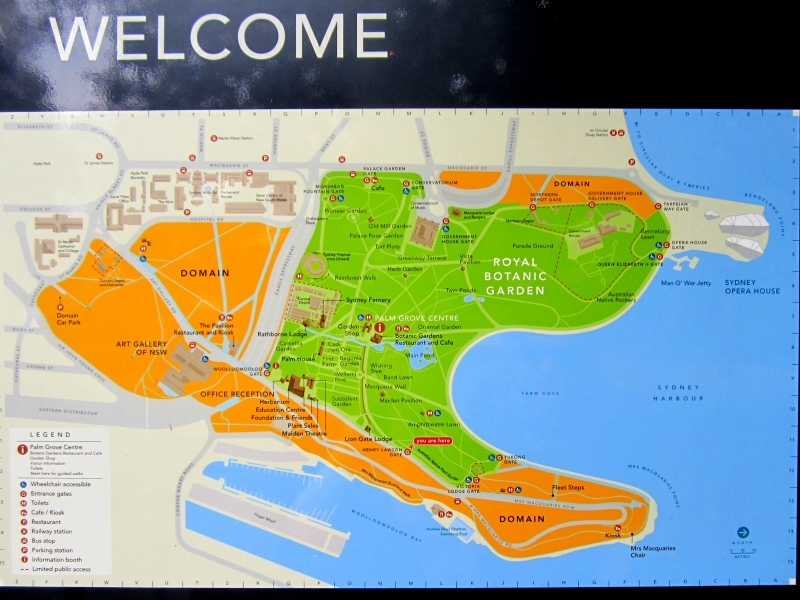 The Royal Botanic Garden gets its own post because there was a lot to photograph. See below for 67 photos, mostly of birds, flowers, trees, and more harbor views (as if there weren’t enough photos of the bridge and the Opera House already). Over the course of something like 11 hours, The Northern Explorer train took us through beautiful scenery from Auckland to Wellington. Below are 11 photos from the train and 76 photos from Wellington (mostly taken in the botanic garden). My husband and I stayed overnight in the airport hotel in Sydney at the beginning of our Australia/New Zealand holiday. Then we moved on and met his parents in a hotel in Auckland. We didn’t really do anything in Auckland except take a daytrip to Waiheke Island. Below are 12 photos from our visit to Waiheke Island, where I admired the flowers, tasted some local wine, and bought a small brass bird sculpture. I enjoyed my recent trip to Australia—or, as I like to call it, The Place Where Some of the Coins Are Huge, Most the Flowers Are Purple and All the Birds Are Really Weird. I went there to attend a writers’ retreat with two writer friends. Photos from my visit with my family include 21 images of cars, food, and natural and man-made scenery around my neighborhood. See below! When we visited the gardens in February, we arrived too late in the day to climb to the top of the Chinese pagoda or even set foot in the Japanese Gardens. This time, we arrived earlier. See below for 29 photos. My favorite is the spiral one pointing up towards the top of the inside of the pagoda. My husband and I visited the Cloud Forest and Flower Dome at Gardens by the Bay. Below are 77 of the 246 photos I took. Below are about a dozen photos from a stroll through Fort Canning Park from the National Museum of Singapore to Liang Court. Below are a handful of photos of flowers, leaves, and paths I saw there on this particular visit. My husband and I went to visit the Chinese Garden. The place looked a little worn, which in a way was refreshing since much of Singapore is shiny and new and lacks that friendly patina old places have. As the sun went down, there were a lot of people out jogging in the relative cool. We strolled around and I took a few photos before the sun disappeared and the park was filled with shadows from streetlights. 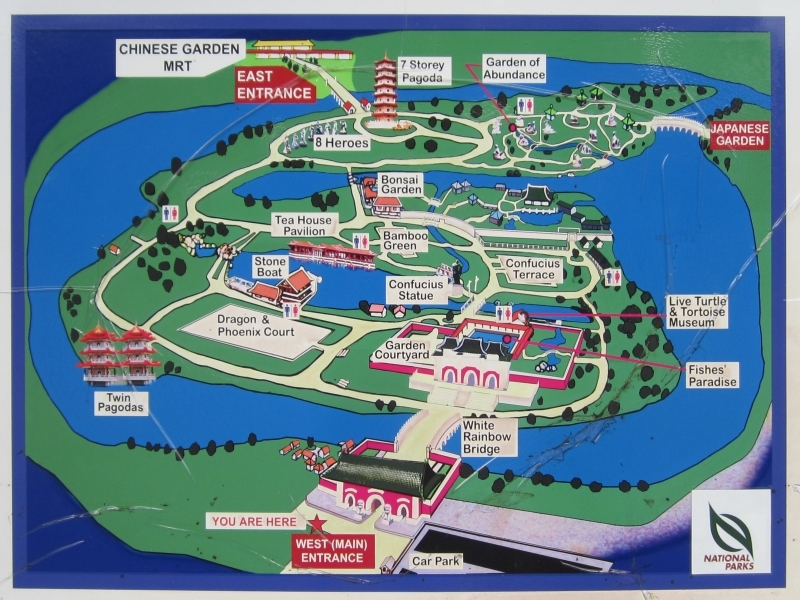 This is a pretty good map of the place.